Jadeveon Clowney is a spectacular athlete. The number one overall NFL draft pick is fast, smart, and ruthless, and it wouldn’t be a total surprise if he were to eclipse Bruce Smith’s 200 sack record in the space of his career. But Jon Bois of SBnation thinks Clowney can do it in a single game (of Madden.) 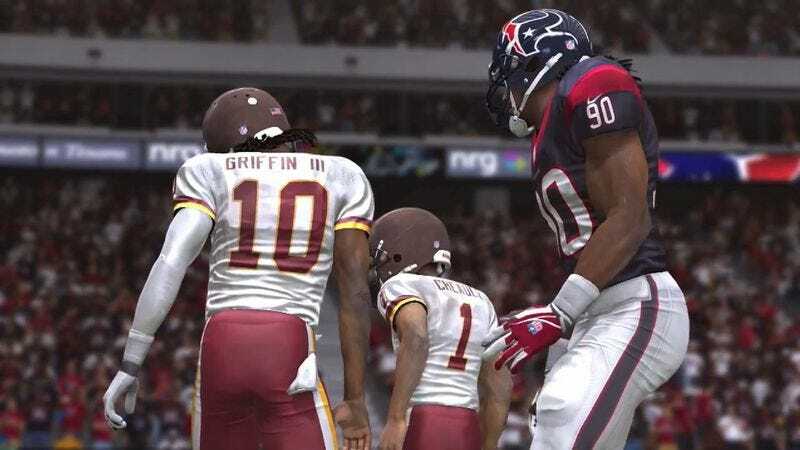 In the return of his excellent Breaking Madden series, Bois sets up all the variables in Clowney’s favor: pumping up Jadeveon’s already formidable in game stats to their limit, reducing the Washington offensive line to a pack of five foot tall, 160 pound idiots with zero football skill, and even toning down the abilities of the Texan defense to gift Clowney 100% of the sacks in the game. The result is bedlam, with Clowney literally trampling over the Redskins’ offensive line to sack Robert Griffin III at every opportunity. Madden stops recording sacks at 31 and overall tackles at 63, so Bois has to manually mark down every sack. The players, and the game itself, end up silently pondering their own purpose, sitting down and babbling mournfully. In the end, Bois quits at 114 sacks, not because the game won’t let him continue, but because virtual RG3’s hopelessness and broken spirit appealed to his human decency. Read the whole article here, before checking out Breaking Madden’s (seriously amazing) first season.